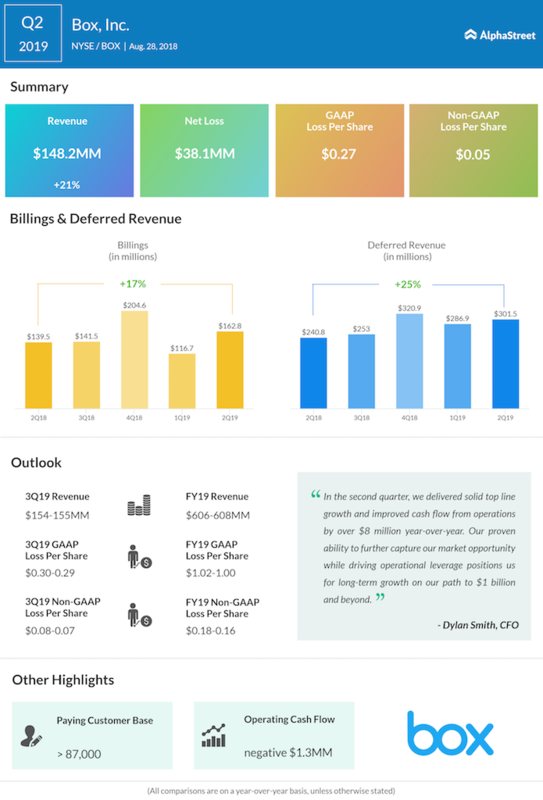 Box Inc (BOX) is slated to report its third quarter 2019 results on November 28, Wednesday after the bell. Analysts expect the cloud technology company to post a loss of 7 cents per share and revenue is touted to be $154-155 million. Box’s performance outside the US markets is expected to play a key role for the recently ended quarter and in the upcoming quarters also. For the second quarter, Box reported a narrower net loss of $38 million or 27 cents per share and revenue rose 21% year-over-year to $148 million, both exceeding the analysts’ estimates. The number of paying customers increased 2,000 to 87,000. For the quarter ended October 31, 2018, the cloud content management firm guided adjusted loss of 8 cents to 7 cents per share. For fiscal 2019, Box shrunk the adjusted loss per share outlook to a range of $0.18 to $0.16 versus the prior estimate of $0.19 to $0.16 and tightened the revenue outlook to a range of $606 million to $608 million from the prior forecast of $603 million to $608 million. The recent sell-off in the tech sector pulled down almost all the companies in this space and Box also succumbed to the pressure plunging 35% in the last three months. The Redwood City, California-based Box has got 87,000 customers. Investors will be looking at how the company is performing in the non-US markets, which represented 24% of the company’s total revenue in the second quarter of 2019. With global product offerings, the company expects to boost its business in EMEA and Japan regions. Box’s rival Dropbox (DBX) reported its third quarter 2018 results earlier this month and the company beat both bottom and topline estimates. Dropbox’s paying users and ARPU increased to 12.3 million and $118.60 respectively from 10.4 million and $112.05 in the prior year quarter. Shares of Box closed at $17.28 on Monday, up 1.65% and were down about 1.5% when the market opened on Tuesday. The stock, which plummeted to a yearly low ($15.71) last week, had lost 18% so far in this year and 27% in the past one year.